A section of Midewin restored by TWI displays the distinctive rolling terrain caused by Ice Age glaciers. Photo by Gary Sullivan/TWI. The Wetlands Initiative is currently restoring a vast 1,800-acre tract on Midewin's west side—the latest project we've undertaken in partnership with the Forest Service there. An archaeological dig is also underway on part of this tract and, as we coordinate so as to not interfere with one another's work, it's got us really interested in the site's history—and even prehistory. Through a three-part series, we'll be digging into the complex relationship between Midewin's past and its future. This first installment focuses on the geological and early ecological history of the land—ancient forces that underlie the habitats TWI is restoring today. The path to understanding Midewin begins in the very distant past. The most ancient piece of the puzzle is the bedrock, deposited hundreds of millions of years ago during the Silurian Period when what is now America’s Midwest lay under a warm sea. Midewin’s bedrock is dolomite, which can result in soil containing unusually high concentrations of magnesium, a determining factor in the types of plants that will thrive there. It is generally buried deep beneath the soil, though there are areas where erosion has brought the foundational dolomite close to the surface, resulting in very rare habitats like dolomite prairie and wetlands. 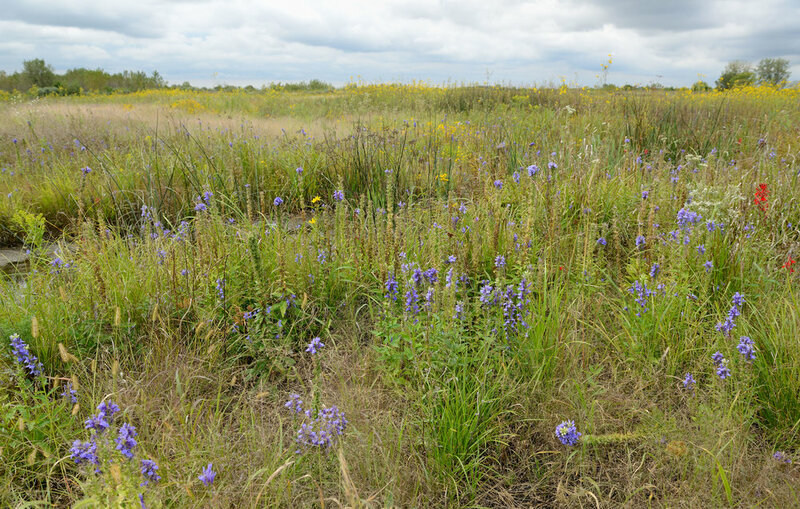 TWI recently completed restoration of an area at Midewin nicknamed Lobelia Meadows, where the dolomite in some places is within 12 inches of the soil surface. Speeding forward in time, the Pleistocene Epoch (known to most of us as the Ice Age) began to sculpt the gently rolling landscape that visitors see at Midewin today. The glaciers of the Pleistocene crept in and out of the Mississippi River Basin over many millennia, pushing and pulling along rock, sand, and boulders—collectively called till—as they gradually built Illinois’ topography. The bulk of this frigid landscaping occurred during the Wisconsin Glaciation, which took place between 50,000 and 18,000 years ago and stretched as far south as Shelbyville in Illinois. This slow procession resulted in the series of moraines (ridges formed by glacial deposits) that typify Midewin’s landscape and supported many unusual habitats. One of TWI’s current favorite spots at Midewin is an area we’ve taken to calling Secret Ridge, a moraine that we’re restoring to rare gravel prairie as part of the new 1,800-acre project. According to Joe Wheeler, Midewin’s Prairie Archaeologist and Tribal Liaison, the glaciers began to recede and expose the land roughly 18,000 years ago. The resultant tundra existed for another 4,000 years, followed by spruce forest, then a spruce and black ash swamp. By that time, mastodon and mammoths roamed the Midwest at the top of the food chain. Fossils of both have been found in the Joliet area; an enormous mastodon tooth that was unearthed nearby is on display now at the Midewin Welcome Center. Midewin Archaeologist and Tribal Liaison Joe Wheeler holds a mastodon tooth discovered in the area. Photo courtesy of the U.S. Forest Service. Besides the geological record, another way we’re learning about Midewin’s distant past is through the ancient ecological record. Since 2016, Dr. Madeleine McLeester and Professor Mark Schurr of the University of Notre Dame have been working in the Middle Grant Creek area of Midewin. In addition to her training in archaeology, Dr. McLeester is a palynologist, which means she studies plant pollen and spores, as well as other microscopic organic material extracted from sediment. At Midewin, she has been analyzing pollen from cores pulled from the land or discovered on buried artifacts in order to build a knowledge of the flora that existed at different periods throughout the site’s history. Her research will give us a remarkably accurate picture of the progression of habitats in this area over time.